Everyone has seen those lacy fern-like spikes with the tiny daisy-like flowers in the summer. This time of year what’s left of the flowers turns white and they can be quite attractive if they are not invading our flowerbeds. This weed is dog fennel or wild chamomile (Eupatorium capillifolium) and it can have many uses aside from its looks. Many think it adds to a perennial garden. If you’ve ever pulled any, you noticed a strong odor. Some like the smell and others don’t. Mosquitoes generally don’t like it. Native Americans used this perennial to repel them and some folks still use it today. I haven’t noticed much benefit, but likely additional preparation might be helpful. Juice from the entire plant can be extracted and applied topically to treat bites of reptiles and insects. Dog fennel can grow six or seven feet tall and can take over an area if not kept clipped. Its leaves are hairless, but stems are quite pubescent. It grows best on moist fertile soils and invades quickly. This upright aster relative tolerates dry conditions and does well on sandy soils. It also tolerates a wide pH range. Regular mowing generally keeps dog fennel from becoming a problem in our lawns. It generally self-pollinates, but wind spreads pollen and seeds meaning plants could pop up anywhere. Dog fennel is not difficult to control chemically. Numerous herbicides will kill it. One reason I chose to write about dog fennel is because there is much confusion surrounding it. Some foragers and herbalists speak in glowing terms. It is also useful for lost hunters to recognize, because the dried down from flowers and foliage makes great tinder. Being able to start a fire could save lost hunters, hikers and fishermen. Other folks, especially livestock farmers consider this plant poisonous and a nuisance. 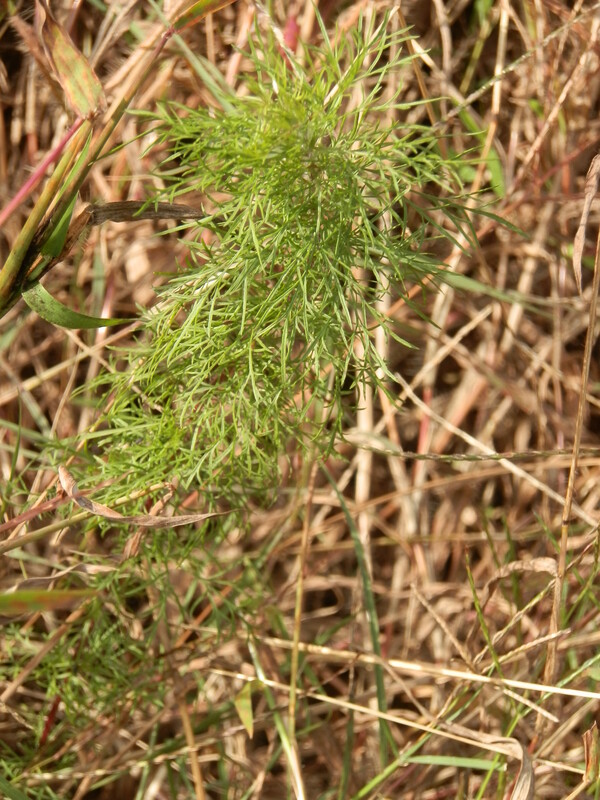 Toxicity problems are not common since dog fennel has poor palatability. Even deer don’t usually eat it unless there is no other food left. The major culprit is an alkaloid called pyrrolizidine. As a general rule, alkaloids are bitter-tasting compounds. This one in significant quantities can seriously damage the liver. Leaves also contain low levels of tremitol, which causes dehydration when ingested by cattle. I do not recommend eating this herb. It is not a substitute for domestic fennel. The two species aren’t even related. Fennel is in the carrot family. Some use the foliage in small quantities as a spice and many sources list it as edible. Some call it wild chamomile, but I wouldn’t recommend brewing any tea from it if you value your liver. Common names of plants can be dangerous. I consider dog fennel useful only when used externally. Oils in the foliage can soothe sunburn and other skin irritations. Numerous sources document its insecticide potential. To many it also has aesthetic value. The green lacy stems are attractive in flower arrangements as filler material. In fall the dried flowers make a nice accent also. Dried stems resemble florist Caspia but don’t last as long before shedding. Above is a young dog fennel plant in fall. Normally young seedlings like this are more prolific in the spring. 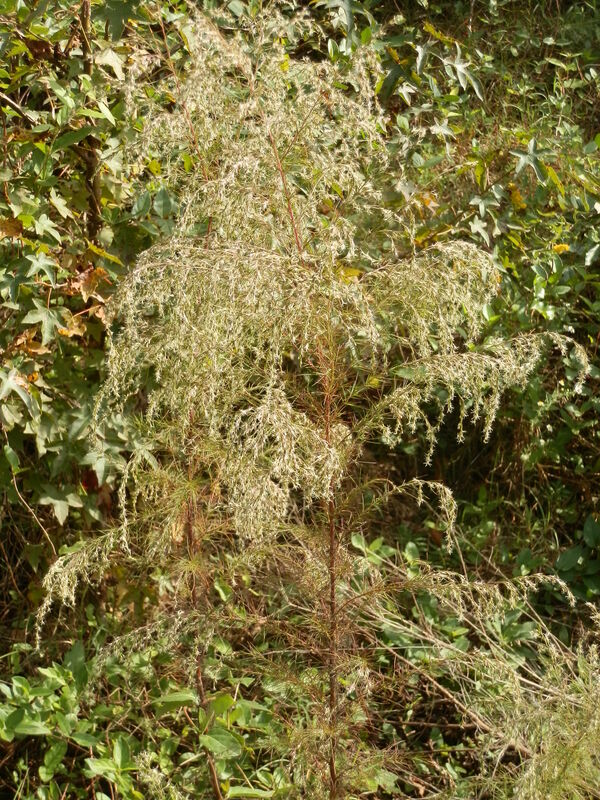 This entry was posted in foraging and tagged dog fennel, Eupatorium capillifolium, flower arrangements, foraging, great tinder, insecticidal properties, nature, poor palatability, pyrrolizidine, toxic. Bookmark the permalink. It’s cool that this plant can repel mosquitoes and the oils can soothe sunburn or skin irritations. Its very interesting that this plant can do many things, it has a lot of uses and pretty much all of them are useful. I like that this plant can repel mosquitos. its cool that this plant can repel mosquitoes and can help with sunburn to. Since this plant can repel mosquitoes i should consider having a few around my house. i would love to grow some to help me with mosquitoes in the summer nights and for sunburn and bug bites too! I tihnk its neat that a misquteo dont like it i would of never thought of that. The uses of the plant are useful and incredible. I think its pretty amazing that this plant can repel mosquiteos. I like how useful it is and can repel misquitos. i think this is a kind of cool plant as it repels misquitos, also helps with bug bites and sunburn. I think it is pretty cool that it repels mosquitoes and I think i have three in my yard. I’ve heard of this before being used for an mosquitoe repelant. awesome that it can repel misquitos..definitely a very useful plant. I need to get this plant and put it around my house ! i Hate mosquitoes ! I would love to have this plant around my house for the mosquitoes, i think its great how this plant can also help save those who may get lost in the woods. now that is what i call a great plant!!!! It’s weird that dog fennel and domestic fennel aren’t related, if I saw there names together I would have thought they were. I have neer heard of using this to repel mosquitoes. I like that it can help with sun burn and all. I like how it’s useful for sunburns and skin irritations and love how it repels mosquitoes. Dog fennel is cool because it can repel mosquitoes. The oils form the plant can soothe sunburn or skin irritations. Dog fennel have many uses but almost all of them are useful. 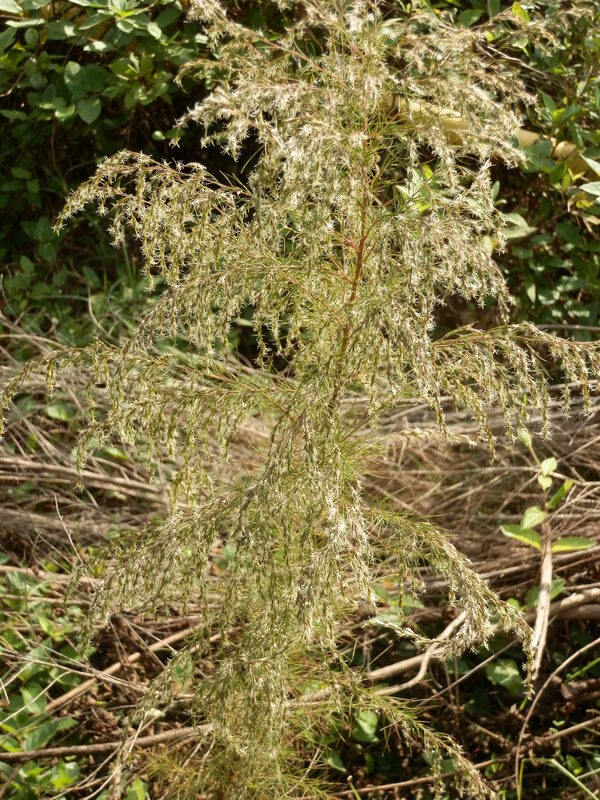 it is a very unique plant, the chaff kind of looks like spider webs. From this post I learned how beneficial Dog Fennel really is. It’s odor can repel mosquitos, the plant juice can be extracted and applied topically to treat bites of reptiles and insects, and the oils can soothe sunburn or skin irritations.